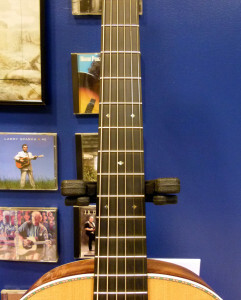 This limited edition Martin guitar is available for sale to dealers only in 2015. 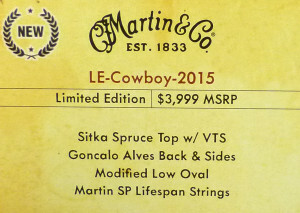 We end our reviews for 2015 with a look a Limited Edition sold to Martin dealers only in 2015, the LE-Cowboy-2015. It is a most interesting guitar that will surprise many people with its pretty tone and charming personality, once it gets out in more shops. A traditional 12-fret 000 with a slotted headstock, the guitar is made from Gonçalo Alves, first used on Martin guitars nearly 200 years ago, but never in anything remotely like the modern era. And these old-timey features have been wedded to progressively modern Martin features like a top of torrefied Sitka spruce and their innovative Simple Dovetail neck joint. Martin’s previous “cowboy guitars” were primarily considered novelty items. They harkened back to the budget guitars of the 1940s and 50s that often had western scenes stenciled on the top, evoking the many Wild West TV shows and movies popular at the time. They were usually barely more than toys, considered starter guitars or for children, and occasionally as a novelty instrument for notable personalities. 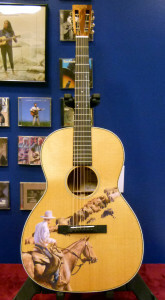 The Martin versions, which first appeared in 1999, were likewise made with the construction of their most affordable line, the X Series. They were made from a high pressure laminate (HPL) that is basically sawdust and resin. It is cheap, tough and virtually impervious to environmental issues like humidity, and highly reflective in terms of sound production, so it gives off a nice, loud and pleasant tone, especially for the money X Series guitars cost. And it also allowed Martin to apply all sorts of colored finishes and printed artwork to the surface of HPL guitars. So they came out with occasional models that featured cartoon scenes of, say, ranch hands at a corral, or gathered around a chuck wagon campfire. They even included effigies of CEO Chris Martin and other company officials, among the cowboys. The LE-Cowboy-2015 isn’t one of those instruments. It is as far from such things as a Texas Longhorn steer is from a Borden employee wearing a Bessie the Cow costume. The guitar is made with all-solid tonewoods and stands apart from the other Cowboy guitars in several other ways. Overall it is a “real” guitar of professional-level construction and quality, not a guitar-shaped poster to display on a guitar shop wall or be used to paddle a canoe when not employed to serenade the passengers. And the artwork that adorns the top is, well, real art. The LE-Cowboy-2015 exhibits a tableau by the critically acclaimed painter William Mathews, whose work often depicts Western themes inspired by his tours of the great ranches throughout the American West. Titled The Sagebrush Sea, it is a lifelike portrayal of a working cowboy with a ten gallon hat, mounted on horseback and escorting some cattle through waist-high sagebrush on a clear, sunny day. Martin recently perfected a technique that allows them to print such artwork directly onto a solid wood top. And I love the way the grain lines in the maze-colored spruce seem to engulf the cattle, as if the proud beasts were wading through an endless expanse of deep grasses. While some people may see the embellished top and immediately dismiss the LE-Cowboy-2015 as something that can’t be taken seriously as a musical instrument. That opinion should change immediately upon giving it a test drive. It is well made, designed with great thought, and is a delight to play and hear. Martin’s Standard 12-fret 000 size first appeared in 1902, five years before Butch Cassidy and the Sundance Kid robbed their last bank. Even though it was enormous compared to the older sizes, it very much retained the same basic design that Martin had been using since the days of the Pony Express, before the American Civil War. 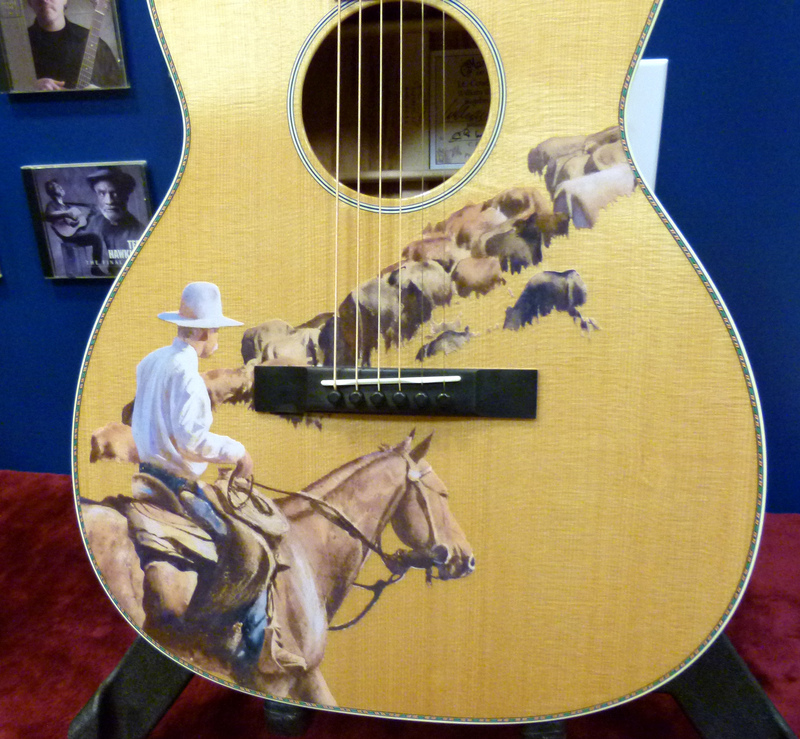 So it seems an appropriate size for a guitar evoking both Martin tradition and the legacy of the American cowboy. It has the straight ebony bridge of period Martin 12-fretters, and the short pattern diamonds and squares on the ebony fingerboard. The neck is made from genuine South American mahogany, but carved in a modern Modified Low Oval profile and having a traditional 1-3/4” inch neck that would have been found on a 30s OM, rather than the wider 1-7/8” neck used on all 12-fret Martins back in the day. it also features a half-herringbone, or “rope” pattern purfling made in brightly colored wood fiber of green, yellow, red, and blue, modeled after the purfling used by Martin on their Style 30 and Style 34 guitars, from the 1850s to about 1920. So not only does it fit the period associated with the glory years of the American West, it harkens to the rope or lariat trim seen on period cowboy guitars, although none of which sported anything so fine or attractive as is this trim. The same colorful marquetry is used for the seam strip running down the center of the back, made from exotic Gonçalo Alves. On my very first visit to the Martin Guitar factory, my now old friend David Musselwhite gave me a close look at a guitar made by C.F. 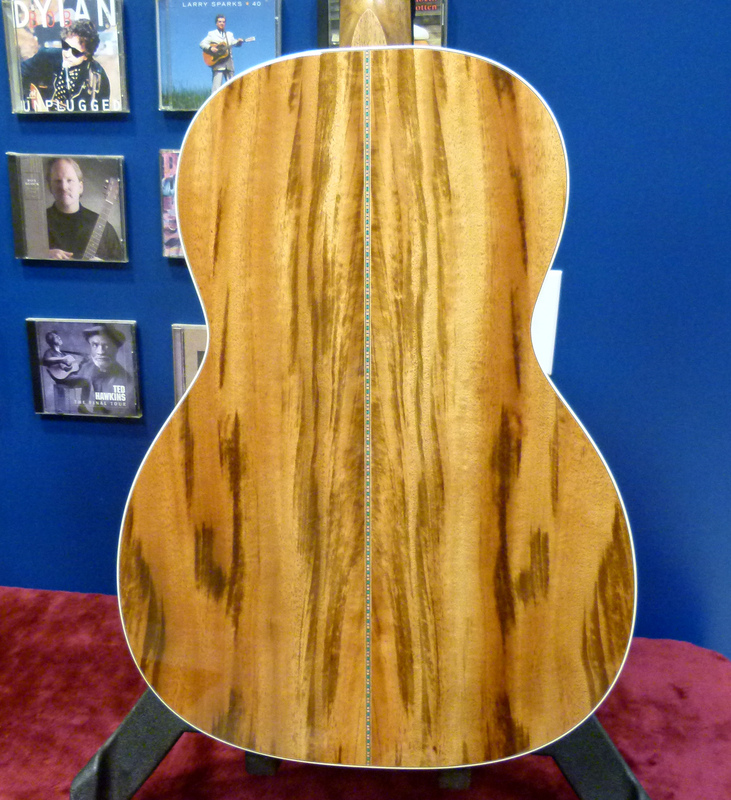 Martin Sr. most likely in the late 1830s, made from what was believed to be koa wood, which only grows in Hawaii. No one knew how that wood could have made it all the way from the Sandwich Islands and into the hands of an obscure craftsman in the U.S. in an era when both locations were still mostly wild frontiers half a world apart. Other Martins from the same period made from this mysterious wood have been cataloged, but it was only when researchers were delving into the earliest ledgers in the company archives, for the 2014 book Inventing the American Guitar: The Pre-Civil War Innovations of C.F. Martin and His Contemporaries, when it was discovered to be Zebrawood, known in its native environment by the Portuguese name Gonçalo Alves. While it can resemble koa in color and grain patterns, it grows naturally from southern Mexico to tropical South America. The prototype I played was primarily blonde and butterscotch in color with some darker, streaking patches similar to a lot of the koa seen on Martins in the early 1900s. 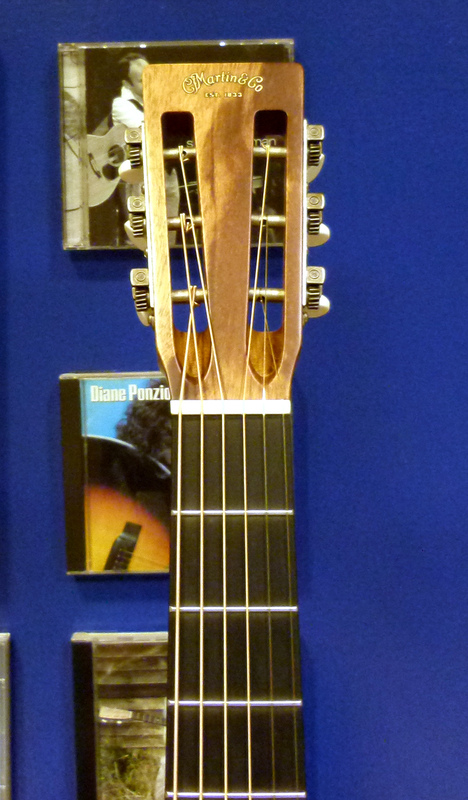 But when it comes to tone, Gonçalo Alves is very much its own thing. It has been used by other modern builders, but this is the first time Martin has built with it in a very long time. 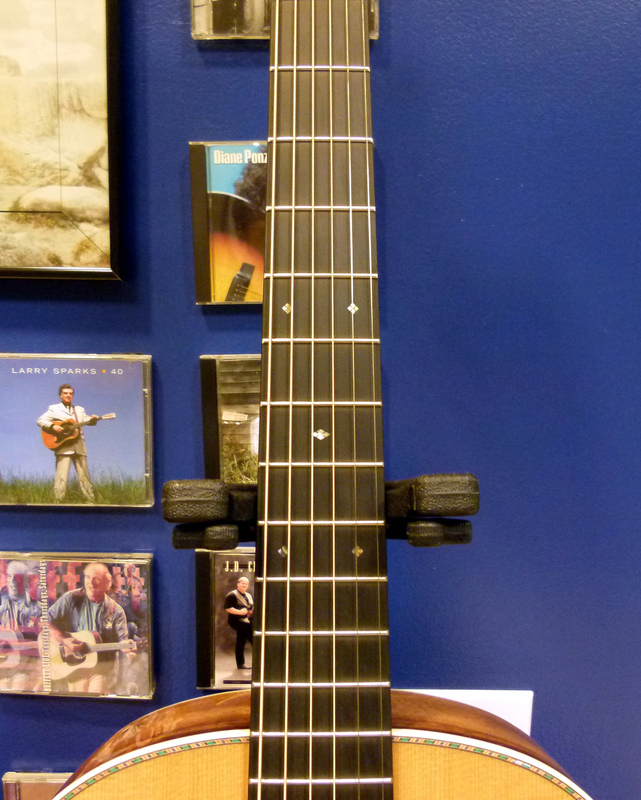 The word that keeps springing to mind as I played it is “musical.” The LE-Cowboy-2015 gives off a pretty musicality from a clear and spacious treble, and the wound strings report with piano-like authority across the midrange and bass, defined but with a quick bloom of bassy undertone resonance, all quite similar to what I hear in Madagascar rosewood. But there are none of the complex harmonics and layered sympathetics one hears in any of rosewoods. It is much more in the drier, arid spectrum between maple and mahogany when it comes to complexity and overtones. With a slope-shoulder silhouette and wide bottom bout, the resulting sound chamber inside a 12-fret 000 creates a full-bodied voice, with a strong bottom end and substantial fundamental notes across the registers. That size can sometimes result in a lush voice, yet one with a muddy patch in the low-mids, in the case of rosewood guitars. That is not at all what happens here. The Gonçalo Alves is more straightforward in its character. The well is full of wavering, glimmery resonance, but it is clear and fresh and made up primarily of direct reflections of each fundamental, without a lot of competing and overlapping harmonics. It does not come off as warm as mahogany, but it is more fleshed out in the bottom end, or at least differently than what comes from maple, or other hardwoods like cherry. And while it is pretty to look at and listen to, the most impressive aspect is how rich and expansive all that translucent but substantial resonance sounds, as if the sound chamber was much larger than the physical dimensions of the guitar. And that can be credited to Martin’s Vintage Tone System of wood torrefaction. An ancient technique updated by modern science, torrefaction is a means of treating wood with high heat to remove the inherent and environmental moisture, which greatly changes the molecular interior of the cells, crystallizing them and in a way breaking in the wood so it behaves like wood decades or even centuries old. The LE-Cowboy-2015 has a top of Sitka spruce that was treated with the M1 level of torrefaction used on Martin’s Authentic Series of vintage guitar recreations. That particular treatment aims to replicate the physical properties of wood between 70 and 100 years old, fitting very much with the overall theme and motif of this guitar. While the marketing spin suggests the VTS makes a new guitar sound like an old one, it does actually accomplish that in certain ways. The guitar sounds very open and expansive and “broken in” like an old guitar can sound. And this particular guitar has considerable 3D depth behind the fundamentals, which is increased by the clarity in the top notes and the pretty harmonics hovering over all. And it actually comes in at a very reasonable price, considering the appointments and special artwork gracing the top. Partly this is do the fact it has the Simple Dovetail neck joint, which is achieved with the use of a robot that cuts both the neck block and the neck to line up precisely. It is a major improvement over the old Mortis and Tenon joint used on lower-level Martins, while not being as large a dovetail as found in the traditional Martin neck joint that requires a highly skilled craftsman to carve and set it by hand. While it may not have as robust a voice with the smaller neck joint, it is still a very good guitar, made of very good tonewoods, including a VTS top that is so alive with personality and presence. All in all, this is a very successful guitar and will appeal particularly to people who have always wanted a 12-fret Martin, and will be drawn to its unique looks and nice accents, such as the engraved plates and ivoroid buttons used for the tuning machines. Others will be taken by its clear, vibrant and lovely tone.